Although the classic comedy 9 to 5 was first released almost four decades ago, an official sequel is reportedly in the works. One of its lead actresses, Dolly Parton, recently revealed some news on the planned follow-up in a recent interview. According to Parton, original writer Pat Resnick is working on the movie with actress and writer Rashida Jones, with the goal of maintaining the spirit of the first blockbuster outing. 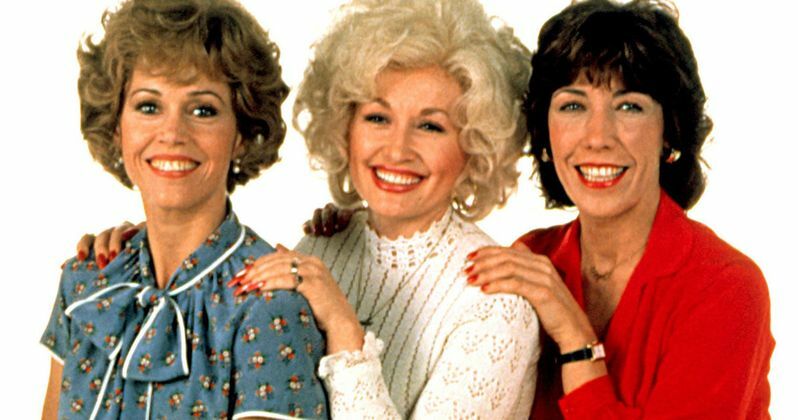 With the plan for the movie to be a direct sequel rather than a remake, the door is open for Parton and fellow co-stars Lily Tomlin and Jane Fonda to reprise their roles. Better yet, Parton seems pretty optimistic that this is going to be the case. "This gives us a chance to have three new young [women], whoever they may be, working at Consolidated, the company that we were with, and then they find these three older women --- Lily, Jane, and myself --- working out in the workplace, and so they wanna find out what we did. They're gonna pick our brains for information, so that's gonna actually lend itself to some really funny stuff, some cute stuff. And then, there's having six great women, instead of just the three." It's no longer unusual for direct sequels to be released which continue the story of older movies. One of the best examples of this is David Gordon Green's Halloween reboot which premiered last month, shattering many box office records. Although it ignores every other sequel in the series, the movie serves as a follow-up to the 1978 original from director John Carpenter. After so many years of Hollywood churning out constant reboots, there seems to have been a shift towards resurrecting classics that don't have a sequel. Movies like Halloween earning such high box office returns can only help similar projects get off the ground, such as a sequel to a classic like 9 to 5 which is almost just as old. The original stars Dolly Parton, Lily Tomlin, and Jane Fonda as working ladies Doralee, Violet, and Judy. Fed up with the rampant sexual harassment going on in their workplace by their boss Frank Hart (Dabney Coleman), the women take matters into their own hands. They wind up kidnapping their boss and secretly control the company in his absence. Although Frank manages to eventually break free, he finds that the owner of the company is impressed with the improvements, which he wrongly attributes to Frank. While the story seems a bit dark on paper, the film is full of wacky moments and is highly regarded for its humor. Perhaps just as famous as the movie itself is the accompanying song recorded by Parton. Also called "9 to 5," the theme song wound up becoming one of the singer's biggest hits of the decade. It was nominated for an Academy Award and topped the Billboard Hot 100 chart, also winning a People's Choice Award and two Grammy Awards. The song went platinum and continues to be played in jukeboxes all over to this very day. It seems more than likely the classic song, or maybe a new version of it, will be worked into the upcoming sequel as well. Parton says the time was right to do the 9 to 5 sequel in the midst of the MeToo movement. Companies everywhere are cracking down on misogynistic behavior and sexual harassment in the workplace, and the message of the original 9 to 5 holds up to this very day. With the writer and original cast involved with the sequel, hopefully it will be able to recapture the same spirit of the first film. You can read more of Parton's interview at Entertainment Weekly.